Senators are currently outlining their thoughts on the Protection of Life During Pregnancy Bill 2013 in the Seanad. TWO SENATORS HOPE to table amendments on fatal foetal abnormality on the Protection of Life During Pregnancy Bill 2013. Senator Fiach Mac Chongail told the Seanad today that he and Senator Mary Louise O’Donnell hope to bring forward the amendment at committee stage. The bill is currently into its second stage, where it is being discussed by the Seanad, after TDs voted in favour of it last week. 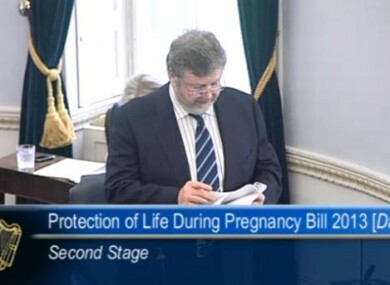 The Minister for Health, James Reilly, outlined the facts of the bill to the Seanad. The senators are now having their opportunity to speak about the the bill. Regarding the potential sentence of 14 years in jail for a woman who has or assists in an unlawful abortion, Minister Reilly said that he would like to point out that prosecution may only be brought by or with the consent of the Director of Public Prosecutions, “and clearly he or she would use her discretion”. He added that his department has already commenced the consultation process with relevant professional bodies, and it is expected that a multidisciplinary committee will establish guidelines. Senator Marc MacSharry said he did not support the bill, and that there is no evidence that suicide is a treatment for abortion. “The bottom line for me is I want to protect life,” he said. He added he fears the “floodgates” might open. Senator Colm Burke said he supports the bill. Senator Fiach Mac Conghail also supported the bill, but said that he and Senator Mary Louise O’Donnell would be tabling amendments in relation to the issue of fatal foetal abnormalities. The Senator said that pregnant women “must be trusted” and that he is concerned that the bill will not reduce the number of women who travel to England for abortions. Senator Ivana Bacik also welcomed the bill, but said she would like to see the law go further. She said that some arguments being made against the X Case judgement say that it is “too easy to fake suicide risk” and could open the law to abuse. Bacik also stated that it is “simply not true to say pregnant women or girls are never suicidal” and that it may be rare but it does arise, but this is not just due to mental illness. The Senator added that “there is no treatment for suicide” but that what psychiatrists do is assess risk of suicide and ways to prevent that risk. On the issue of term limits, Senator Bacik said “we cannot insert time limits [into the bill] because it would risk the woman’s life”. Senator David Norris also spoke, saying that he is “absolutely outraged by what is continuing to go on in this country”. He also said that if Taoiseach Enda Kenny was telling the truth by saying the bill will “change nothing”, that “means that Savita Halappanavar would die again. Is that something to be proud of? Well, I certainly don’t think so”. Email “Two senators hope to bring amendments on fatal foetal abnormalities”. Feedback on “Two senators hope to bring amendments on fatal foetal abnormalities”.